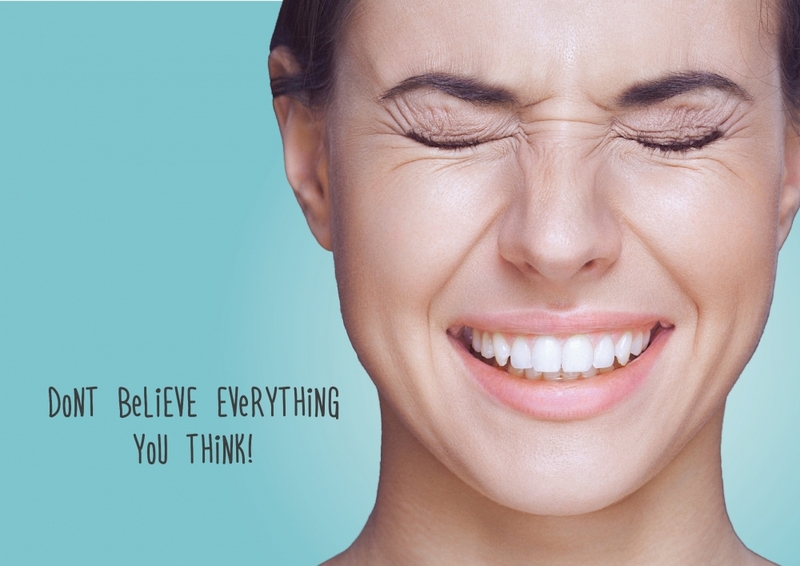 Find out about 'Don't Believe Everything You Think' on The Wellness Directory. Then find a Counselling or Life Coaching or Lifestyle & Relationship Coaching or Neuro-Linguistic Programming (NLP) practitioner to help you with Low Self Esteem, Personal Development, Relationship Problems. I call these thoughts ‘dodgy’ in the sense that they rarely produce an accurate picture of what’s really going on, they don’t help us access useful information or creative ideas, and they almost always drain your energy. A good example of this is when you start doubting your ability or dreading a meeting that’s coming up because of your pesky thinking. And I don’t know about you, but I've certainly had times when I've brought into the hype; starting to really freak about whether I can do this, or if they’ll like that … all because I’m taking these thoughts much too seriously. Well, let’s get this straight …. each thought you have is merely an electrical impulse. A spark. More specifically, an electrical signal travelling from neuron to neuron via the synaptic gap. And, they do not have to be taken seriously. Now, I know some of your thoughts are useful and important, and deserve your respect. All hail the intelligent thoughts. However, we must learn to take the rest much less seriously – particularly because most of them are firing off from old programming and conditioning that no longer serves you. Notice how effectively one thought can derail your day. Just thinking “I hope I don’t stuff up that meeting this afternoon” can have us miserable and sweaty all day as the creeping death of THE MEETING approaches. And that one thought (possibly followed by several other equally unsavoury ones) was just a neuron firing – mostly out of habit. AND it’s not true! Honestly. It’s just a spark of electricity. And do you really want your life to be ruled by a bunch of electrical circuits? The trick is to cultivate your ‘higher’ wiser mind – yes, you do have one. Consider what you’ve just been pondering – those times when you are doing negative or unhelpful thinking. Who is the You who is noticing that thinking and reflecting on it? It’s that part of you who thinks, “Man, I was giving myself such a hard time.” This ‘observer’ part of you that notices the dodgy thinking – and knows better - is the part we need to cultivate. I think of this as our ‘higher’ mind or ‘wise self’ – which is also in training by the way because of course, if you haven’t been super aware of this wise observer-self much lately it is probably somewhat under-utilised right now. It could get a little wiser. I believe our ability to see our thoughts for what they are – electrical impulses – gives us the space to make new choices about how we are affected by those thoughts (or not). It lightens things up. It offers the possibility of a pause to simply notice the thoughts arising and not be taken in by them. There is extreme power in simply noticing what is happening. Master your awareness. This ability to notice our thoughts and make a choice about how we respond to them is what our frontal cortex is all about. Sometimes referred to as the ‘executive functioning’ area of the brain, this area is what distinguishes us from other mammals who are generally reacting on their primal instincts alone. If we only reacted on our primal instincts, we’d think of that worrisome meeting approaching and bolt from the building (our fight/flight response is very effective!). "You are not your thoughts"
I invite you to start taking your dodgy thoughts less seriously. That means noticing them and letting them flow on by, like a log floating on a river; it will bob down through the current and go around the corner in a moment. Don’t ignore your thoughts or try to make them go away – that’s just asking for trouble since your brain will just argue back (what we resist persists). Just be the wise observer, noticing them, breathing and that’s it. It doesn't help to layer criticism on top of it either. Clients often say to me “I know that’s a silly thing to think”, and I say let’s not heap any negative judgments on a dodgy thought. It’s just a dodgy thought. When we do this judging we are simply draining more energy away than we’d already lost in the first place by giving ourselves a hard time or worrying about what might go wrong. Phew! • Step back from the thought for a moment and see it for what it is. An electrical impulse. A habit thought. This lightens it up and is a reminder that you are not your thoughts. You can also step back and check its validity. Simply ask yourself, "Is that really true?" • Be curious about what you may notice as you simply observe the thinking that is going on. Sometimes our understanding deepens out of this, and sometimes the worry or emotion simply falls away. "When we are mindful, deeply in touch with the present moment, our understanding of what is going on deepens, and we begin to be filled with acceptance, joy, peace and love”, Thich Nhat Hanh. • Take the time to create space for yourself. It's so easy to rush through the day, often feeling non-empowered and non-energised, only to get to the end of the day feeling tired and down on yourself. Why not take a few minutes to catch that dodgy thought in the morning, take a few slow deep breaths, and let the feeling move; allowing a more peaceful place inside from which to experience the rest of your day. You’ll be more effective and productive too. Thich Nhat Hanh explains "Freedom is not given to us by anyone; we have to cultivate it ourselves. It is a daily practice... No one can prevent you from being aware of each step you take or each breath in and breath out." Our human intelligence hinges on our self awareness. Krishnamurti said “observing without evaluating is the highest form of human intelligence” so let’s be intelligent about this – don’t believe everything you think! Karen Ross is a respected coach working with individuals to make sustained meaningful change. Discover fascinating new ways to achieve your goals and create the kind of life you want with transformational coaching. Learn practical strategies and skills that empower you to take control. Don't you owe it to yourself? !